The Super Moon appears through the clouds on my drive west to Kalamazoo, looking big and full on the horizon. A good omen, I think. And, just beautiful at five in the morning. Yep, I got up at four o'clock to get over to the Kalamazoo Marathon in order to pick up my schwag and bib before the race. Last year I indulged and stayed at the Radisson the night before, but it's just not worth the money, especially since I would be getting up early anyways. Early is early to this night owl. Getting into the race Start is super easy. I park in the same spot as last year, right across from the start, with with easy access back out when I'm down. Way more convenient than the Detroit Marathon, for example. Spring has sprung here in Michigan. Muggy. I bit chilly, but not too bad, and I may even be overdressed, with running shorts, running pants over them, and two wicking shirts, the short-sleeved one over the the long-sleeved. And, barefoot! First barefoot race of the year! I survived last year, so am fairly sure I'll do this one, but (and here come the excuses) I do have some doubts, which both come from the same reason: I've been suffering a plantar wart right on the ball of my left foot for years, way before I started running barefoot. I've been to many doctors, has it frozen, fried and cut off, but it always came back. Once running barefoot, I stopped bothering with doctors, becasue the wart would just 'wear down' (sort of like sandpapered off) from contact with pavement. On longer runs, it would basically get scraped out by the roots, leaving a small hold that sometimes even bled, but I've never mentioned it before, because it wasn't a big deal. In fact, if I didn't run long distance, I would probably just forget it. But this year, having finally gotten insurance, I decided to try the one last treatment that all doctors swore would get rid of it: laser surgery. So in February I had a large hole lasered into my hole. This caused me to miss a lot of running time during the unusually warm winter months here, so I've been feeling that my feet in general aren't quite as toughened up as they were last year at this time. Also, the surgery seems to have left scar tissue, which seems to be much softer than regular callus, so that I now seem to be getting that 'running hole' more easily, or sooner on runs. So...I'm not sure I can make this whole marathon without gouging a big hole in my foot. I'm trying an experiment, stealing an idea from guitar players I've known, who, if their fingers are getting raw/cut up by the strings, apply super glue to the tips as an extra layer. After I park and get my bib and t-shirt (no schwag?!) I return to my truck and begin to apply layers of Super Glue: Let one layer dry, then apply another. I'm hoping this gains me time and distance, though I think it'll eventually wear through. Who knows? And if that doesn't work? I guess 'eep', because I ain't bringing any back up. I'd have sworn that the marathon website said the race started at 7:30, but a PA announcement says it begins at 8:00. So I basically got here an hour and a half early. Oh well. There seems to be less marathoners this year. I think last year there were 1200, and the announcement says 700-800. I wonder why the drop? Also different: the half marathoners will start twenty minutes latter, and then the 5Kers and walkers. I didn't think there was a big problem last year, but oh well, I mean, the half marathon branches off pretty quick and takes a separate route. Would be nice to run with more people. This is also International Barefoot Running Day (IBRD), so people all over the world are running barefoot somewhere. I would have run this marathon barefoot anyways, but the timing is nice. There are supposed to be some other folks from the Barefoot Runners Society website here today, we'd talked on line about all meeting up, so a half hour before the start I head over to the 'Tent City' area. I'm wearing some old socks to keep my feet a little protected until the actual start, and they get soaked as I walk out into the grass. 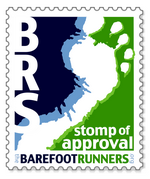 No barefooters that I can see at the Kalamazoo Area Runners (?) tent. There were supposed to be a couple halfers, and maybe a couple 5Kers, plus Smelph joining me (again) for the full, but I cannot find them. Ah well. I head over to the start area, which, since the halfers are being moved back behind us, feels pretty open. I'm over course drawing attention standing here in my socks: People can't seem to figure it out. Like, am I waiting for someone to bring me my shoes?! I do spot a minimalist runner, a woman in Five Fingers, but I don't think she's a BRSer. The weather is nice though. Just a wee chilly so I cross my arms to get my hand in my pits. The sun is actually out, I'd thought we might get rain, though the start area is in shade right now. And lo! Who should I end up standing right next to almost but Mart “Doc” Ott, ultramarathoner extraordinaire, plus his wife Mistique. He wasn't going to run this one, but signed up like four days ago. He too is experimenting: He's going to be crewing for someone doing the Badwater Ultra this summer, so he's got twenty zillion layers of clothes on to try and simulate being hot. Though the thing that gets me is that even someone crewing for Badwater has to train. A crowd is finally forming, and Mark heads up to the 3:30 pacer area. I'm starting out with the 4:00 pacer. I ran a marathon last week, I'm not expecting any great time. Last year I ran this in 4:15. I'd usually start up a little faster, to take advantage of adrenaline, but this year I'm fine where I am. I'll still probably drop back at some point. And without too much hoopla, we're off! I remember this first section of road: it's rough. Not with pebbles, the pavement is just laid out 'bumpily', I'm sure there's some term for it. My strategy is to run on the painted lines as much as possible, they're much smoother, but here there aren't many, and the road is so old that the painted lined are actually where all the cracks are. The good thing about this race is the slight downhill here at the beginning. Without really meaning too, I do that first mile a little ahead of the 4:00 pacer. And we get into a cobblestone section, which some barefooters on the BRS site have said they don't like, but I'm fine with it. Those bricks are nice and smooth. The pack spreads out pretty quickly. We're going through downtown Kalamazoo, which, if it weren't for the race supporters, would be deserted. But the people lining the streets are very enthusiastic, which is nice. On a funny note, I see a sign that says, “Chuck Norris never ran a marathon!” Hell yeah! Oh, more excuses: I've been having this minor sore spot on the top area of my right shin. I don't know if it's shin splints or what, nor if it was caused by running, or biking, or whatever, but for some reason it has come on with a vengeance as soon as I started running. I keep thinking it will go away, that it's mental, but man, I feel close to limping. I thought barefooters weren't supposed to get injured! Fortunately there are distractions, like the awesome women runners. I've fallen in love a couple times already, though of course I must acknowledge that I may be falling in love with them because they are inaccessible and kind of literally running away from me. If one of them actually tried to talk to me I'd probably freak out. A couple of fellow runners ask about barefoot running, and one guy seems particularly interested, saying that he's read about the health benefits. I give him my quick spiel about how I couldn't run for a year and a half due to the dreaded plantar fasciitis, and how when I tried running barefoot the PF vanished. We're running about the same pace and start to talk about other things, like other races. He's slightly older than I, getting the marathon bug, and asks about the ultras I ran last year. We also just go on to other things, like music, and health. As we're doing this, we're running about the Western Michigan University campus, with wide open (and smooth!) roads. He ran this last year as well, and lives in the area, so knows all the buildings and where we're going from here. Having someone to run with, and more importantly talk with, really helps pass the time, and keeps me at a regular pace. When I run by myself, even in a race, I tend to go off into la-la land and run a little slower. Right now, we're actually ahead of the 4:00 pacer and our pace feels ok. I could even be running faster. My feet feel ok, though when we flow back out of the campus and into some neighborhoods, the streets get rough again. And there are even some smoother sections 'spoiled' by small gritty pebbles. Damn the pebbles! The clouds are clearing, meaning the sun is coming out and the temperatures is rising. I'm starting to feel a little overdressed. I'm tempted to just go shirtless, though on the other hand, the wicking shirts are damp, so therefore keeping me cool. Yeah, I think my experiment has failed: I'm feeling that spot on my....I almost said 'left ball', but that would be another problem. The ball of my left foot. At Mile 13 it's been scraped pretty thin. So, ok, I wonder how this is going to play out. But my partner and I are sticking together, kind of surrounded by some of the same people. I called my place in the Start pretty well—I'm not passing anybody, nor is anybody really passing me. I'm still trying to run on the paint lines when possible, which really helps. Even sometimes just getting my left foot on the paint line helps, as my right foot is fine. What he doesn't realize is that he's been inspiring me to keep up this pace. Without him, I would've slowed down already. I'm thinking I may not be able to keep up with him much longer. And then suddenly the 4:00 pacer is right next to me. I'm slightly surprised because I would've thought I'd have heard a pack of runners coming up behind me, but when I look around, she's on her own. Oy. Well, I'd like that. Keeping up with a pacer is just mentally tough for me though, like it almost makes me run slower somehow. But, I'm also just getting tired at this point, and she pulls away, with a couple of the people we've been running with off and on, though I notice that even a couple of them lose her up ahead. And then the big hill. Ah yes, I remember this from last year. My partner and I trudge up,along with a young woman who's been near us for a while, who gets some friends to join her, to the cheers of onlookers. I actually feel strong-ish on it, though probably could have just walked it in the same amount of time. Alas, after the hill, the neighborhood roads get rough again. Damn. Both my feet are raw enough that I have to slow down, and I'm kind of curling my left foot involuntarily, to avoid any grit into my 'wart hole', which just sends pain up my leg. Argh. Gradually, gradually, my partner pulls away, so slow I don't even realize it and before I can say goodbye he's kind of too far ahead, and I have to drop back, and people start to pass me. Damn. I mean, I'm also exhausted, so maybe would drop back anyways, but I feel like it's that one little, but key, spot on the ball of my foot. I wave and smile. That helps. And, I'm going to make. I know that. And when I check my watch, I realize I'm going to make it in a decent time, even if I'm slowing down, and even if now I'm starting to get that weird condition I've gotten before, like that there's an Alien chestburster down in my guts, kinda squirming around. I wonder if it's the pizza? I've been pounding the water too, trying to not be dehydrated, to the point where I'm feeling kind of sloshy, though that might be part of the chestburster effect. And the last section of bike trail is blessedly smooth, free of grit, going along a reservoir, maybe part of the Kalamazoo River, not sure, with some again very enthusiastic volunteers at the fluid stations. I'm keeping pretty steady now, getting a burst of energy now that I'm getting to the end, trying to build up to my regular sprint at the end, leaving 'it' all out on the route. But, drat, one last little section through some neighborhood, and the roads are rough again. Ouch ouch ouch. I can hear the PA announcements from the Finish area, we're close. I just try and pick up my pace, lifting the feet faster rather than trying for a longer stride, which kind of works psychologically because my feet like the idea of being lifted off the rough road as fast as possible. And a left, back out onto that first big main road, Gull I believe, for a half mile. I run on the cement gutter section, avoiding the pavement completely, which works well, and I now I can actually pick up the pace. No grit, just smooth cement. Here goes! The crowd is thicker here, and they applaud both my barefootedness and my picking up the pace. One guy is dressed like a caveman for some reason, barefoot, and he goes nuts when he sees me. I hive five him as I pass. I thank him and check my watch. 4:07. Wow. Faster than last year, even though I thought both that I was in less shape, and that my feet were less toughened up. I know why: having someone to run with. I look around for him to thank him, since he must have come in after four hours, but he seems to have vanished. Ah well, gracias mi amigo. I start to try to explain that I never get blisters, that I only get kind of raw, but then I just show her the bottom of my right foot. And it doesn't. And when I check the left, yep, there's that really bad part, but not as bad as it's been before. But I'm happy to get to my truck and put on my moccasins. Now the long ride home, but I know I'll have a hot bath and a nap, and then treat myself to a movie featuring Scarlett Johansson in a tight body suit. And when I get out on I-94, I get Jimi Hendrix taking me home with “All Along The Watchtower.” Turn it up!